Have you ever fallen in love with a hotel? 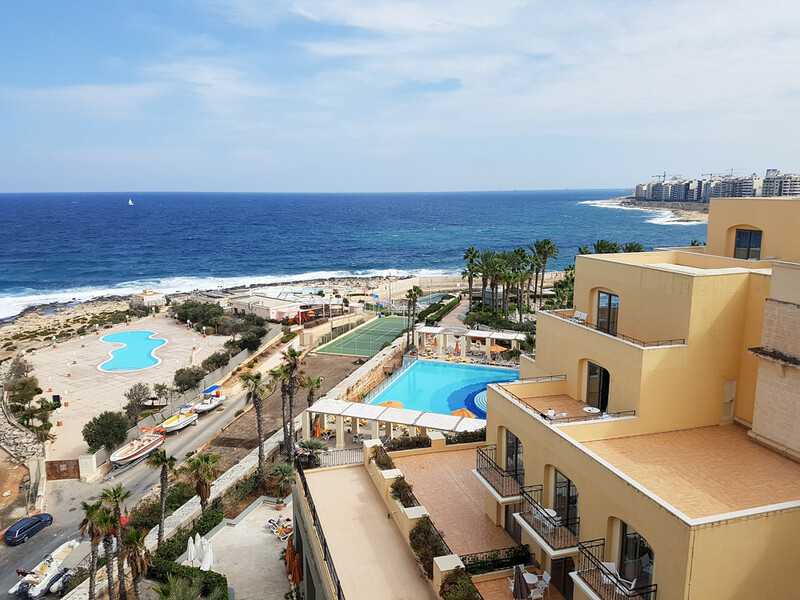 Before I start telling you about my recent stay at the Hilton Hotel in Malta I have to admit that even though my last ten years of intense travel meant I stayed in lots of hotels, I never felt I´d fall in love with any of them. I was impressed, yes, but never like this. I recall my last evening, while enjoying a glass of Sauvignon Blanc on the terrace of the Quarterdeck bar and admiring the view over the Portomaso Marina, how I wished so badly this trip wouldn’t end. When you go on holiday you want to leave all your worries at home and just enjoy quality time together with your loved ones. You want everything to be perfect and this is what you will find at the Hilton in Malta: perfection! Even if the Hilton is a massive hotel with 413 rooms and hundreds of guests every day, I still felt I was treated like a VIP by every single member of the staff. After a crazy journey from the airport where I experienced the chaotic Maltese driving and traffic jams, I arrived at the Hilton in St Julian’s (San Giljan in Maltese). However, all the chaos disappeared as soon as I stepped inside the hotel. I was greeted with a large smile by one of the receptionists standing behind the reception area decorated with an engraved map of the Portomaso Marina. I was early and the room was not ready yet so I was offered a remote control to let me know when the room was ready and my luggage was taken away so I could walk around and discover the Vista lobby lounge. It was a gorgeous sunny day and I chose to wait on the outside terrace overlooking the pools and the sea. At home, in England, it had been raining for over a week and I was craving the warmth of the sun. The terrace is actually brand new and was built during ten weeks of renovation that took place in spring. During the same period, 290 rooms were renovated and given a modern Mediterranean feel. 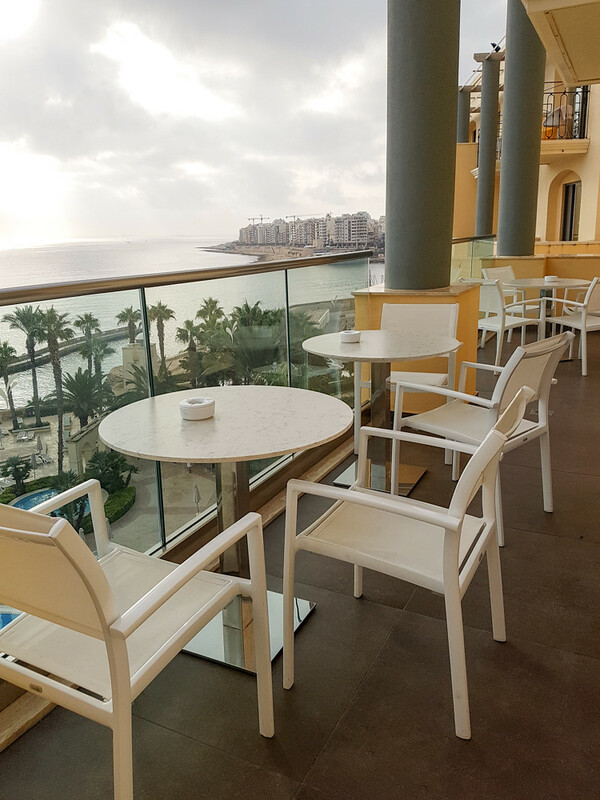 You´ll be pleased to know that all rooms at the Hilton overlook either the sea or the Portomaso Marina, so you will always have a beautiful view and balcony while staying there. The best part is that every morning you can enjoy the sunrise from your bed as the hotel faces east. I knew my room was ready when the remote beeped so I headed toward reception to get my bag. My room was on the 10th floor, which is the executive level. By booking an executive room you have access to the executive lounge on the 9th floor. The reception is situated on the 5th floor (even though when you first arrive it looks as though it’s on the ground floor, that´s because the hotel is on a cliff) and if you want to go further up you need to use your key card on the lifts. I considered this a great security feature restricting non-guests from the upper floors where the rooms are located. The minute I entered the room I was impressed by how spacious, modern and bright it was. Beside the bed there was a nice living room area with a comfy sofa, an armchair and a coffee table. 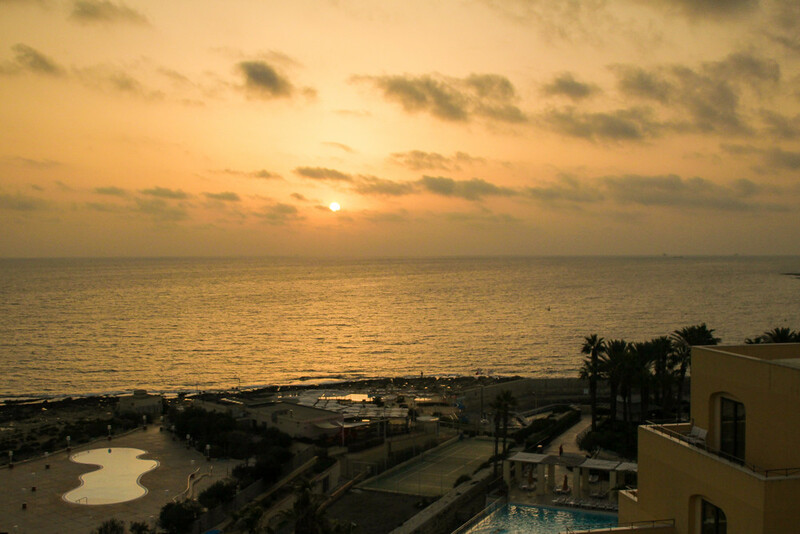 The view from the balcony was breathtaking, overlooking the sea and the pools. One of the disadvantages of travelling so often is that my back gets all the pressure from tiny plane or train seats, crowded buses with only standing room, so when I sleep I need good support so the pain subsides. The bed at the Hilton was simply amazing and I slept like a baby every night, waking up rested and ready for a new day. I discovered later that the Hilton has its mattresses custom designed with extra coil support and an innovative quilt design and plush top which improves circulation and reduces night time restlessness. The pillows were made of foam, which means they mould to your body shape to give you a natural position and they were also hypoallergenic. If I wanted another type of pillow, there was an entire list I could have chosen from for only three euros a day. I was welcomed to my room with a note from the manager of the hotel and a tray of delicious cakes, which I considered very thoughtful. I enjoyed eating them on the balcony while enjoying the view. The first thing I did after settling into the room was take a shower and change into summery clothes. It was 30 degrees outside and Malta was waiting to be explored. 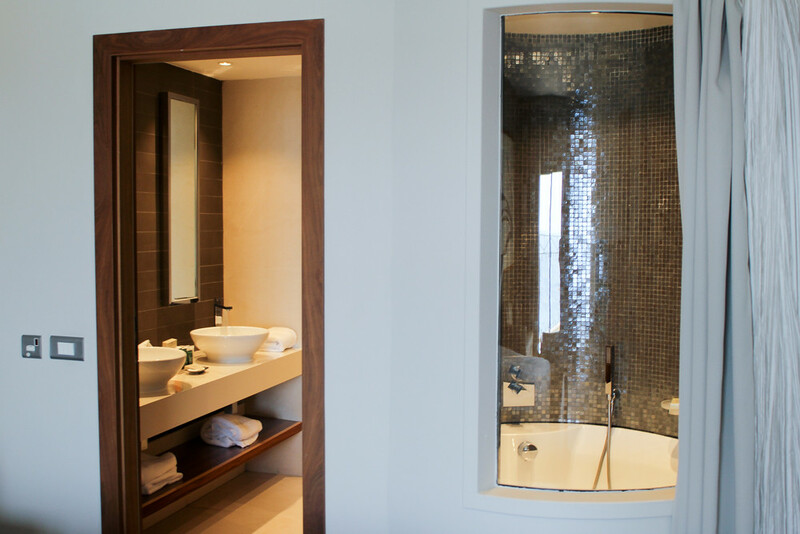 Have you ever imagined what your perfect bathroom would look like? Well the one I was just stepping into was just that! The toilet was at the back, separated by a glass door, next to a large shower cubicle which had a large shower head with great pressure, perfect to relax my shoulders. In the other corner of the bathroom was a large round bath with a window toward the room and a curtain to hide it if I wanted to. 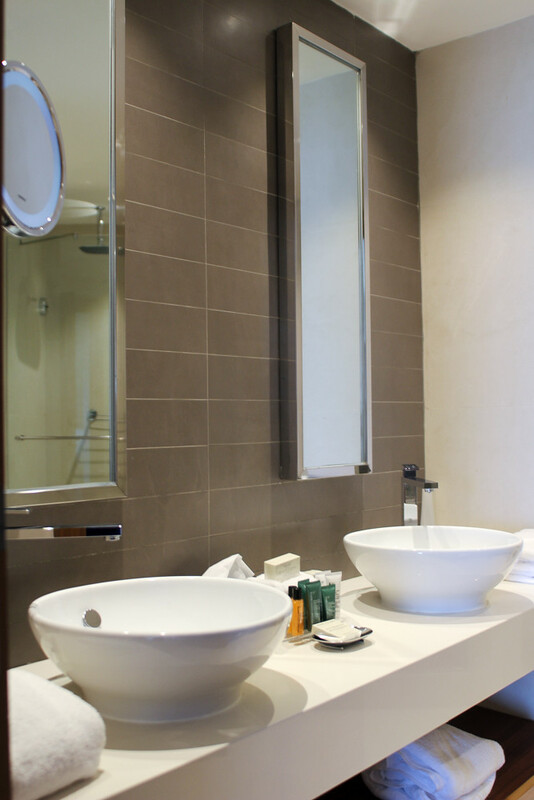 Across from it were two sinks (one for him and one for her) and two mirrors, with a set of luxury toiletries inbetween. One thing that impressed me is that the cleaning lady would come several times a day to clean the room. Every time I returned to the room all the towels had been re-arranged and the toiletries replaced, the bed cover was on or off the bed – depending if it was morning or evening and every day I got a new packet of lemon shortbread cookies and a bottle of water. 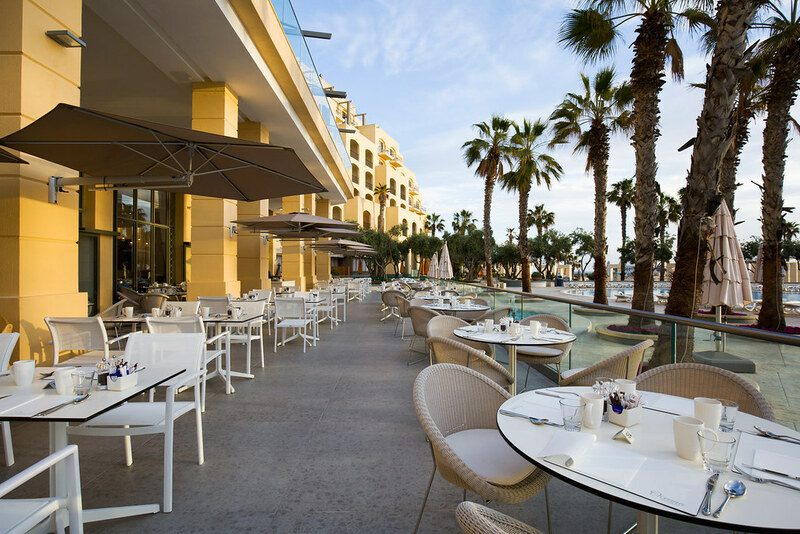 Breakfast at the Hilton Malta is served at the Oceana Restaurant and is an experience in itself. The food selection is vast and covers all tastes. I was happy to find the Maltese food corner where fresh pastizzi and other traditional delicacies were served. Every day there was a different selection. There was even a gluten free section from where I tried out the rice milk for my coffee. 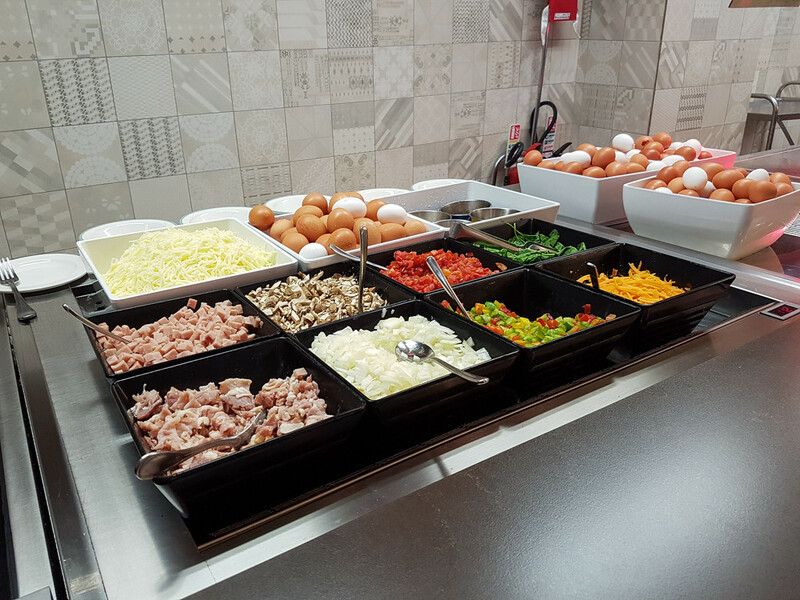 I was impressed by the cooking station, where a chef made omelettes to order using fresh ingredients chosen by the customer. Every time my spinach, tomato and cheese omelettes were perfect! In another corner, another chef was making fresh pancakes or waffles, while another is preparing the freshly-squeezed orange juice. The best time to go for breakfast is before 8, when it’s not too busy. This way you will make sure that you will get to sit and enjoy it outside, by the pool. 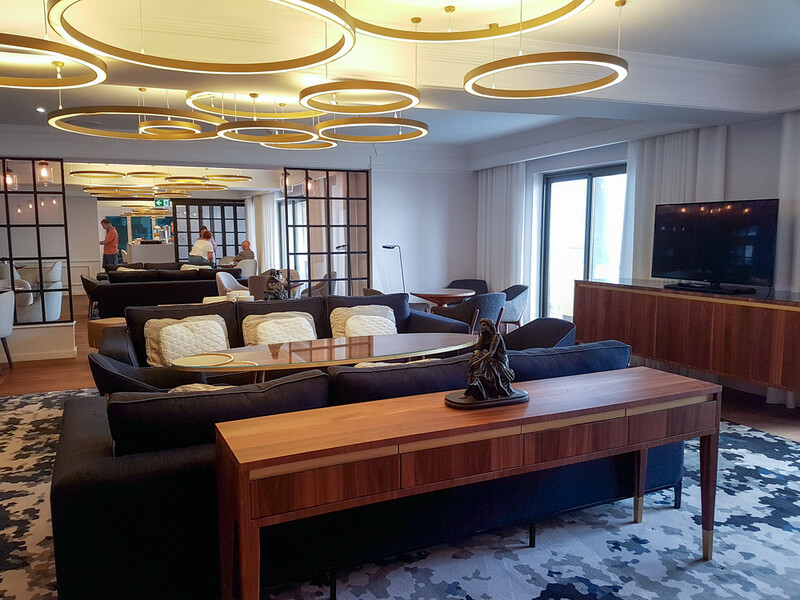 As I mentioned before, if you book an executive room you will have access to the executive lounge on the 9th floor. Here you can enjoy lovely views over the pool and the sea and also have breakfast in a more intimate and quiet atmosphere. 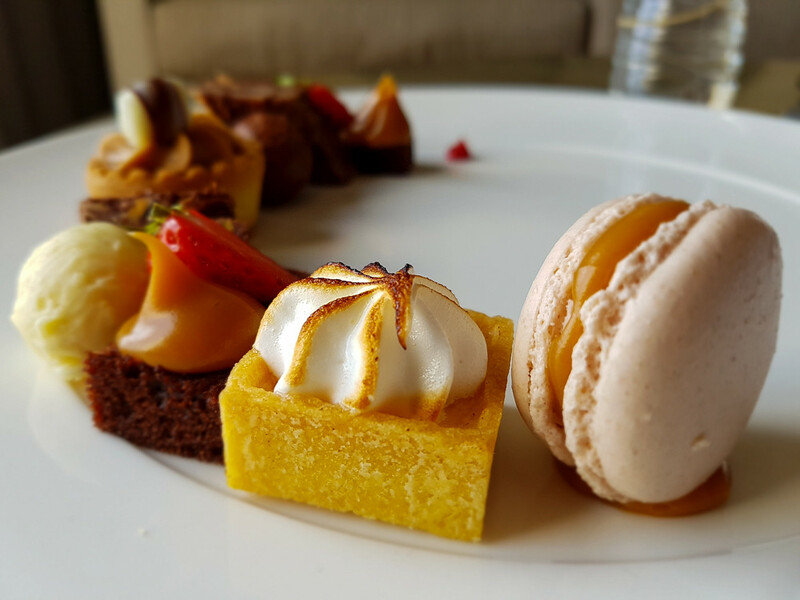 In the lounge afternoon tea is served between 3 and 5.30pm and also pre dinner drinks and canapés between 6 and 8pm. Even if there are a lot of places to explore in Malta, sometimes you just want to relax by the pool with a nice cocktail and a good book. This is exactly what I did. When I checked in, together with my room key I also got a card which I could exchange at the pool for a towel. There were plenty of unoccupied beach loungers and I could choose wherever I wanted to be. Every 2 loungers had an umbrella with a call button and a table with the beach bar menu written on them. There are 4 outdoor pools, a Jacuzzi, two paddle pools, a kids club, the Aqua bar and the Merkanti Beach Club and Bistro which was unfortunately closed for the winter season. If I had arrived just a week earlier it would have been open. One morning I woke at sunrise and went to swim in the adult only pool. It was a special experience because I was the only one there. It was amazing to see the sun rising and its orange rays reflected in the pool’s water. Hilton Malta also has an outstanding health club equipped with an indoor pool, sauna, steam room, fitness studio with more than 35 classes a week, spinning studio, games room, table tennis, squash and tennis courts. 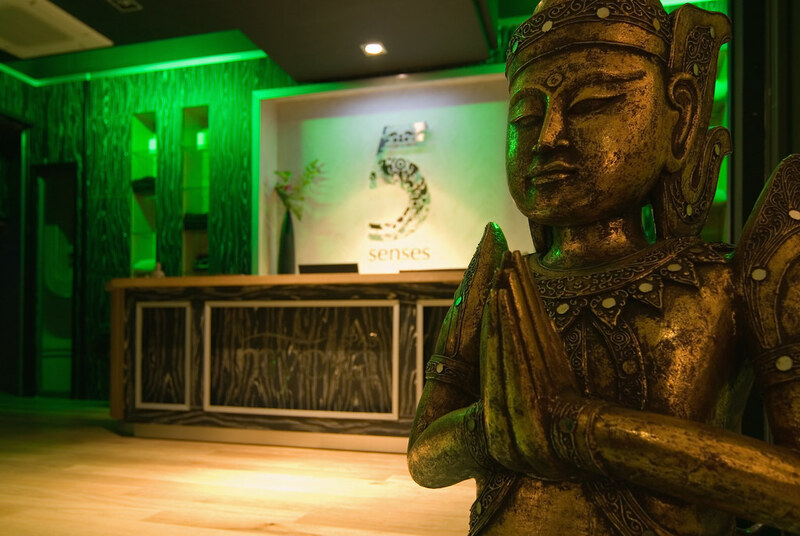 You could also opt for one (or more) of the 80 unique treatments available at the Myoka 5 Sense Spa, where you could relax and unwind. 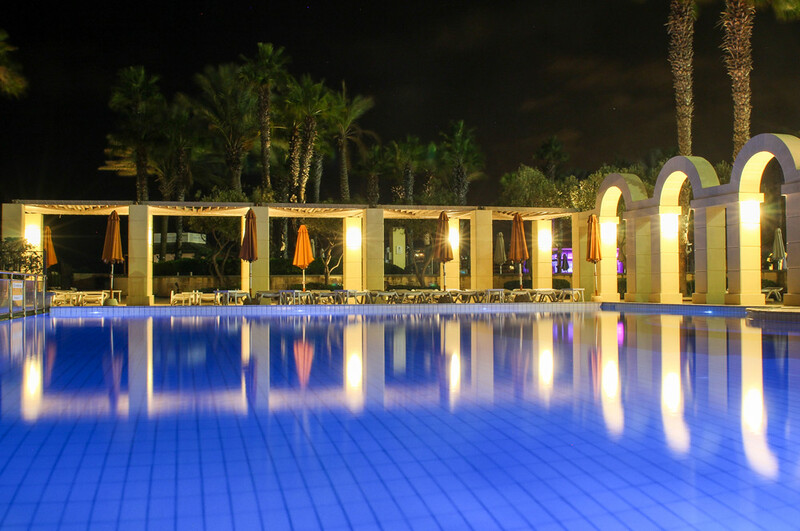 You can actually book a luxury spa break package at the Hilton Malta! 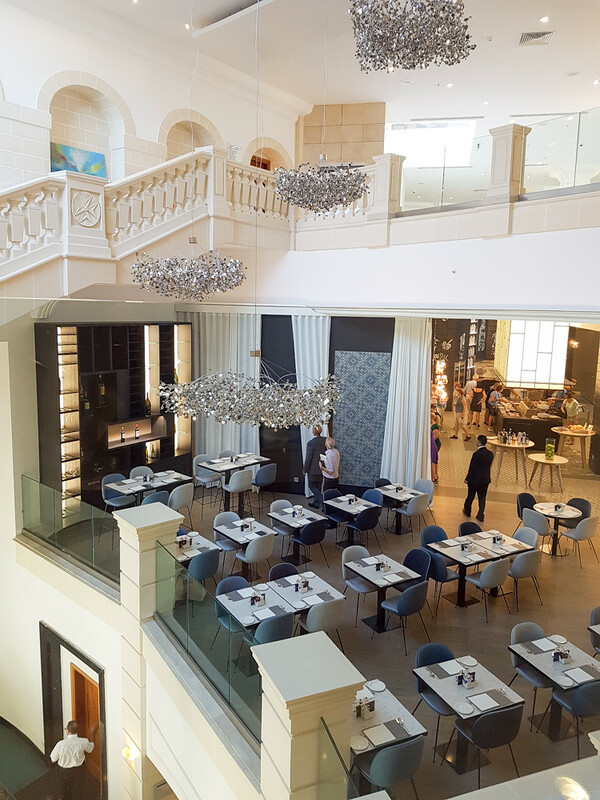 I had the pleasure of dining at Oceana, the main restaurant at the Hilton Malta. 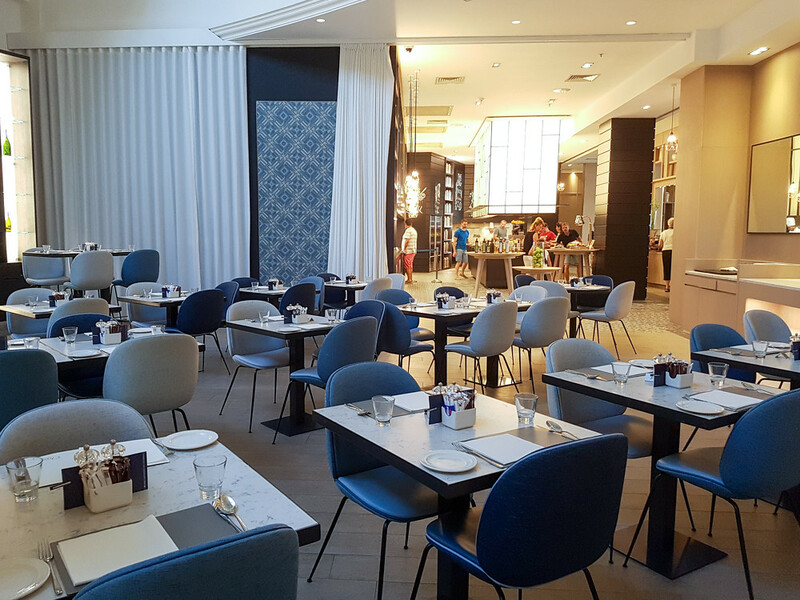 Decorated with blue and white chairs and high ceilings with silver lamps that look like fluffy clouds, Oceana Restaurant is the perfect place to sample the flavours of Mediterranean cuisine. 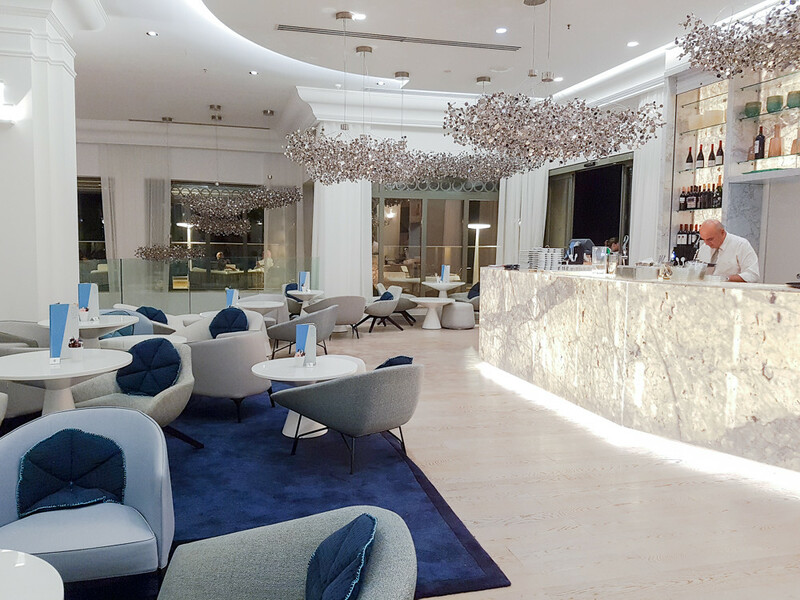 Besides the Oceana Restaurant, Hilton Malta is the home of The Blue Elephant Thai Restaurant (one of a few on the island), the Quarterdeck Bar, the Vista lobby Lounge and the Merkanti Bistro (in summer months). Next time I visit Malta I will definitely dine at the Blue Elephant too. 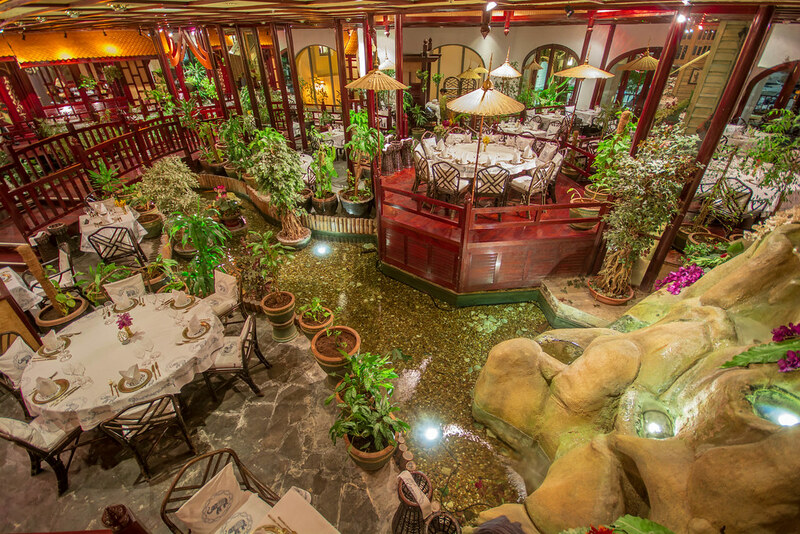 The restaurant is designed to look like an authentic Thai village with lush vegetation and even a waterfall inside. Some of the dining areas are huts and if you require privacy you can always shut the doors. 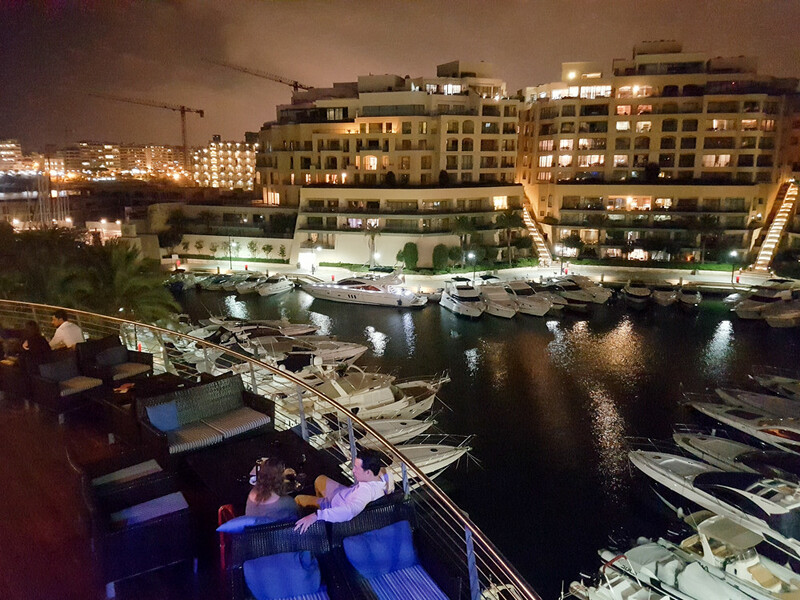 During my last evening in Malta I went for a drink at the Quarterdeck Bar, which is designed with a nautical theme in mind. 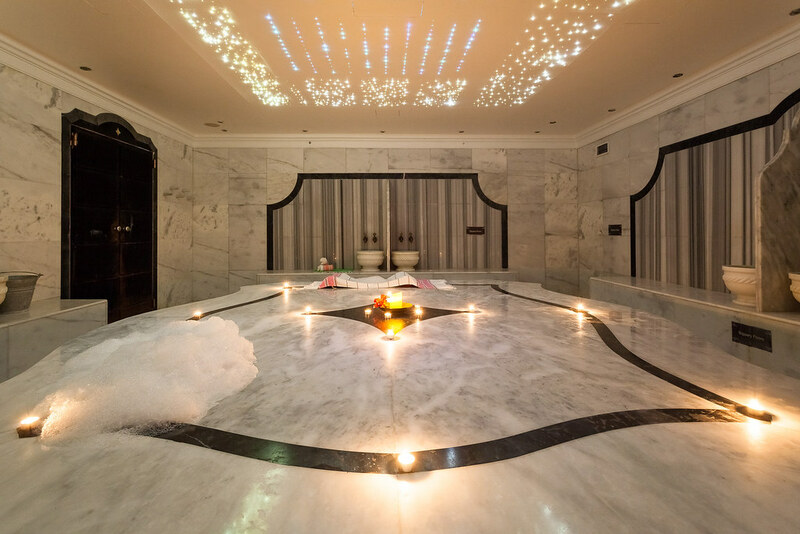 The ceiling is an outstanding work of art with an enormous round painting depicting the 12 zodiac signs. 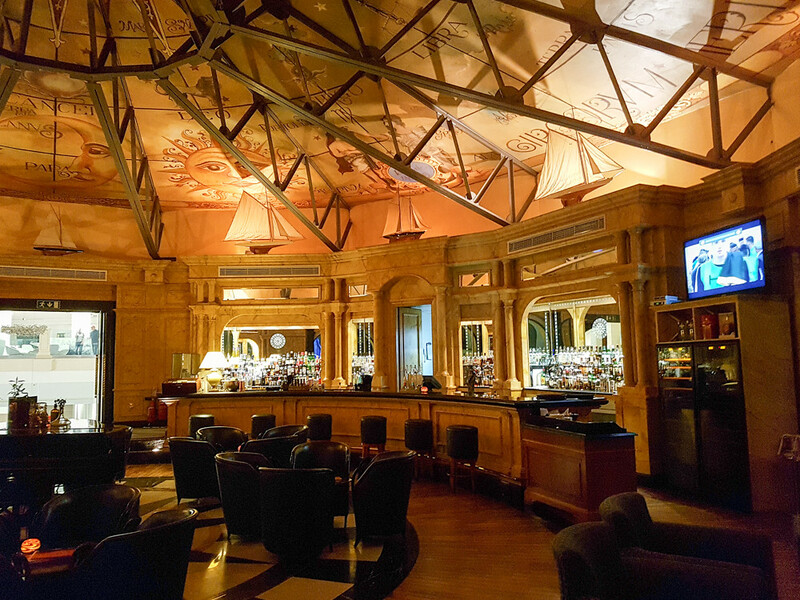 Here, at the Quarterdeck Bar, every Tuesday you can enjoy live jazz music while sipping from a glass of gin. The Hilton Malta is also the perfect venue for weddings with an impressive banquet hall boasting stunning mirrors on the ceiling. In fact, when I was there, five couples were getting married on just one day. 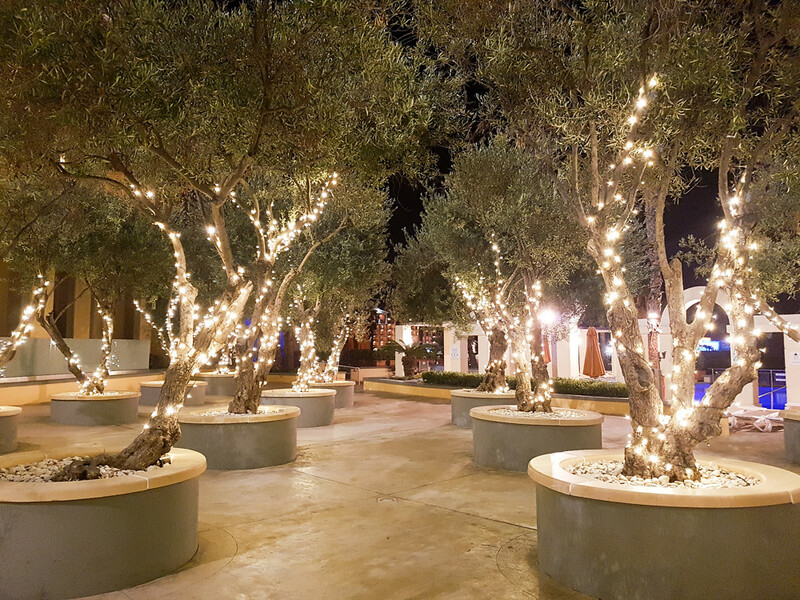 Who would not love to say “I do” among the olive trees around the pools? 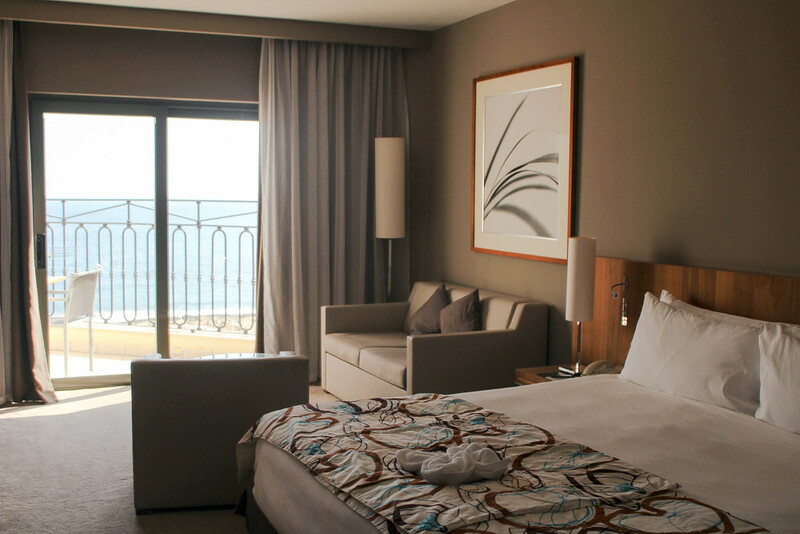 Hilton Malta is located in St Julian’s, just a short 15 minutes’ drive to Valetta or a relaxing 30 minute walk from the Sliema ferry that goes to Valetta. The St Julian’s area is lively with an abundance of restaurants and bars overlooking the sea. Each guest is different and wants their vacation to be perfect. What are the unique experiences and services that you provide to your guests in order to make their stay extraordinary? How much team work goes into making sure that each guest will have a memorable stay? The efficiency and quality of our hospitality is based on consistency, team work and effective communication among team members and departments. Only through a strong and enthusiastic liaison among our people can we work around our guests’ varying needs and special requests, and most of all aim at exceeding their expectations. 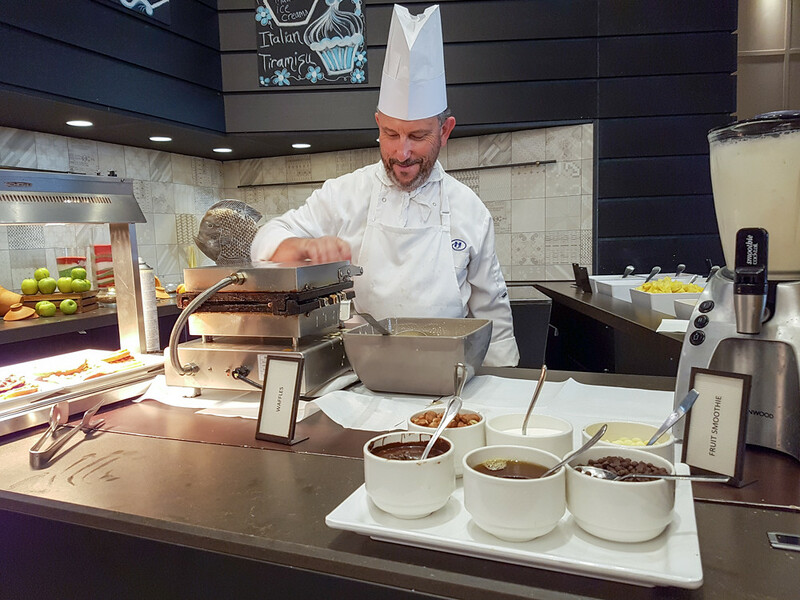 Our teams live by a culture where going the extra mile to support a colleague will make the difference between a guest’s good experience and a great one. How important is the team work at Hilton? Do you have any stories you can share about your team’s successes? Training and coaching team members is fundamental in order to make them absorb the essence of hospitality, and feel comfortable approaching our guests and understanding their requirements. We empower our team to take any necessary action and use their judgement, no matter their level of responsibility, in order to improve guest satisfaction. If they don’t feel they are able to handle a challenge, then they are encouraged to bring it to their supervisor’s attention. This however is not enough: we also train them to be positive whenever a challenge occurs, so that they are able to proactively implement our “Make it Right” procedure, whereby every single team member is trained to action and correct any shortfall in service. Did you ever have any unique requests from your guests? What are some amazing things that your Concierge can arrange for your guests? 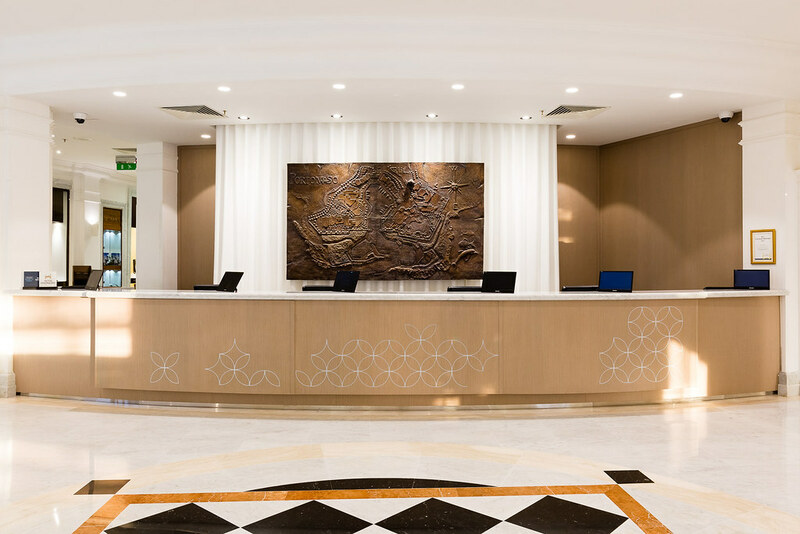 At the Concierge Desk, we assist a lot of guests with information that might seem trivial to locals, such as where to visit and which buses to take, which however is greatly appreciated, particularly by first time visitors. One can easily forget how packed our Island is with history and culture, but we are reminded of it every time we welcome a guest back after a day out exploring Malta. As they recount their adventures and experiences, our guests make us aware of things that we may have missed ourselves. There is no such thing as a routine job in this business – you learn something new every day! This improves our ability to make recommendations to guests, as we get to see things from the perspective of a local as well as that of a visitor. We assist guests on a day to day basis with their transportation requirements, last-minute flight changes, tickets for sold-out events and reservations for top tables at restaurants that are already fully booked! Just recently, we had a request from a Prince requesting a Super Yacht to be made available within the hour, as well as catering requests for exotic foods, drinks and water sports equipment. Needless to say it was quite a challenge being a Sunday afternoon. That said however, nothing is more satisfying than accepting such challenges and seeing everything come together in time for the guest’s arrival. How would you describe your hotel management philosophy? Our philosophy is focused on adopting strategies leading to the achievement of goals and results. We make sure that everybody is on board, understands the set goals, and feels confident that they can be achieved. We also work on ways to reduce waste and utility costs, help our local community and sustain our eco-system. We feel that involving our teams in these processes allows us to look more closely at the operation and identify opportunities for improvement. To this end, we adopt a bottom-up approach where we ask our team members, working in committees, to come up with ideas on working better and more efficiently, to improve our guests’ experience and reach our other goals. What are you doing to reduce your environmental impact and how do you contribute to the local community? At Hilton Malta we carry out a number of sustainable measures to minimise waste of energy and resources, both for the sake of cost-containment and as part of our Corporate Social Responsibility. The culture of reducing waste is part of the induction training given to our Team members, and is reinforced through monthly communication meetings. We use what is called a Building Management System to control and monitor the lighting, heating/cooling and water irrigation systems automatically. 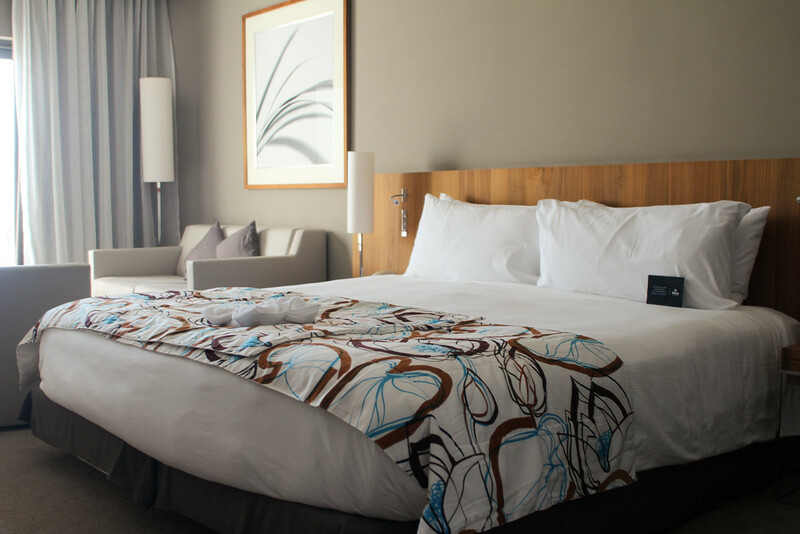 We also have a separate Room Management System to control energy waste in guest rooms. Water aerators reduce water flow in tap water without affecting guest comfort. We are one of two hotels on the island that treat waste water for ‘second class use’, that is, for flushing and irrigation. All lights are of the latest LED low-wattage rating with high lumens. 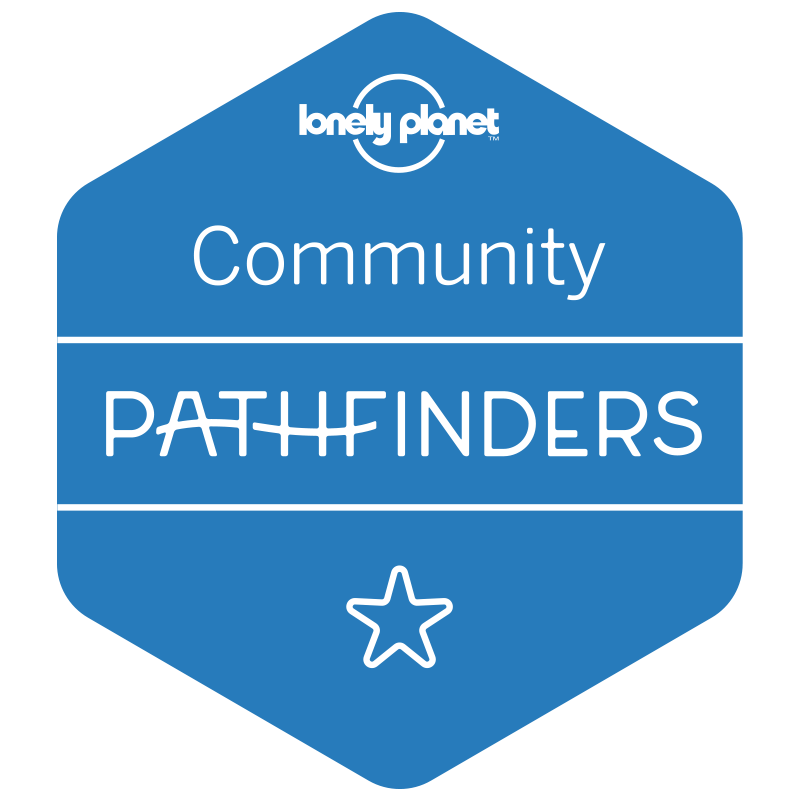 We contribute to the local community first by being an eco-conscious hotel, going well beyond the strict minimum criteria laid out by our regulators. Waste management and separation is practised both in the public and guest areas, as well as in the back-of-house with our team members. Finally, we reach out to young people in the community by providing local and foreign students with information and tours of the hotel for their school projects and assignments. We are proud of our efforts to give back to the community and environment in which we work, and we will keep coming up with ideas to make our contribution more valuable and impactful. Disclaimer: Please note that my stay at the Hilton Malta was complimentary. However, all comments and opinions in this article are my own. OMG! I seriously love this hotel and would definitely stay here whenever I’m in Malta. I love luxurious hotel stays and have stayed in some of the best hotels. It just amazing! 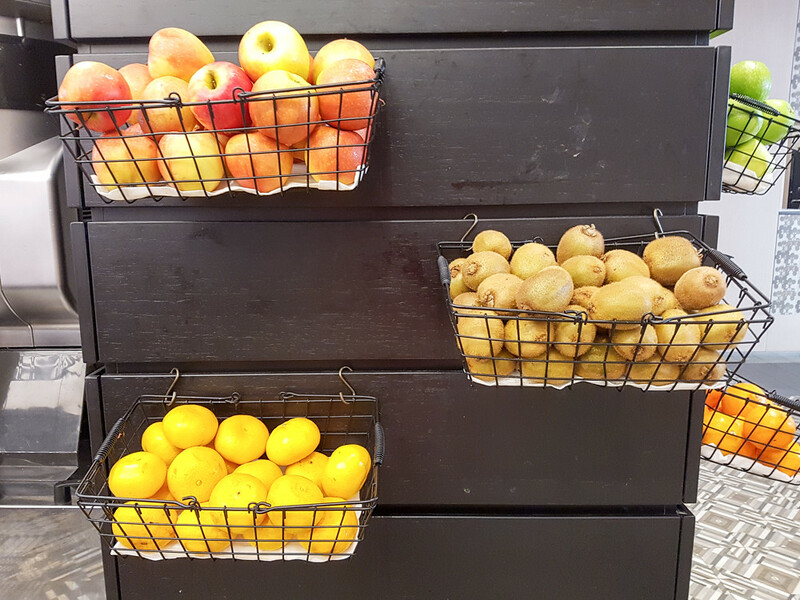 I’ve been to Hilton in Dubai and it was really good as well & I love the fact that they have a strategy that aims to minimize wastes. OH WOW! Holy gorgeous! I love the design. 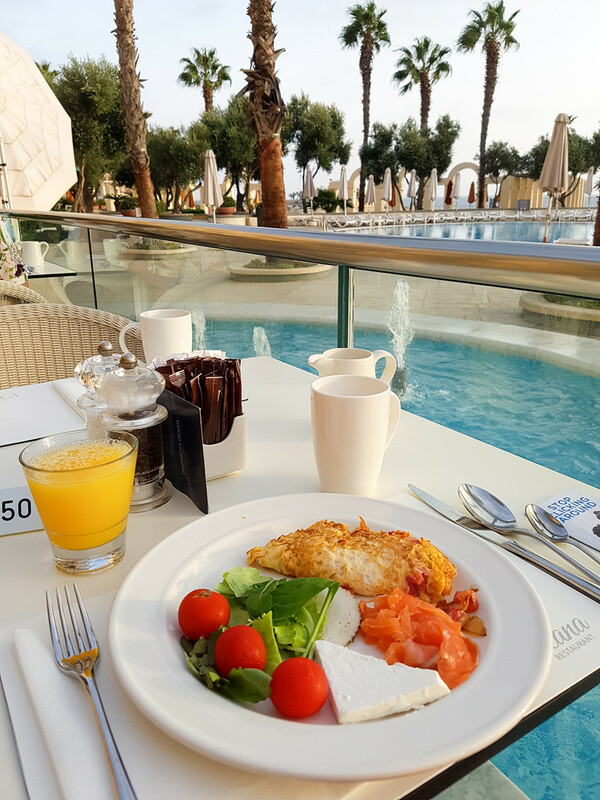 That breakfast outside looks like the perfect start to a day of touring… but honestly who needs to leave the hotel when you’re staying somewhere THAT incredible. The photos really are stunning and luxurious looking! 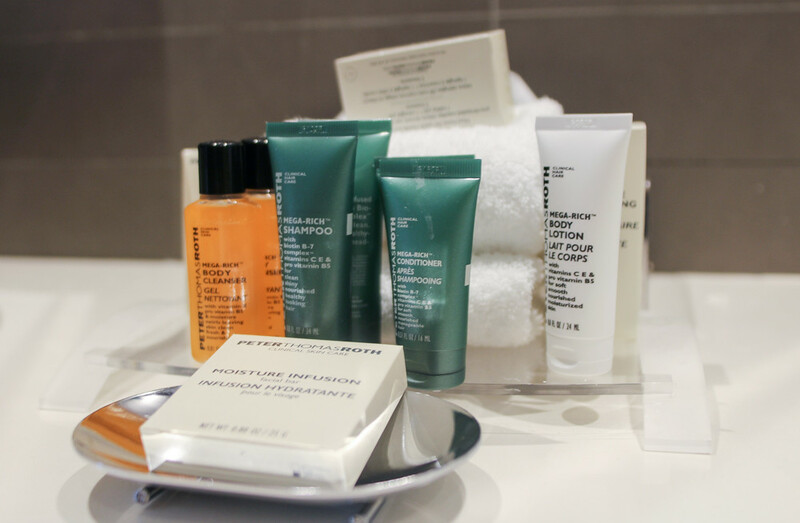 It’s pretty rare to find a hotel with great views from every room or even top of the line toiletries which I love because I have often just started using what hotel offers to keeping my packing light! When I used to travel for business I had always used Hilton and think they are a fabulous chain and would definitely consider them if I’m ever in Malta! I have never fallen in love with a hotel before but this sounds perfect. Not only does the staff sound friendly, the views exceptional but the beds help with back pain which would be great for me, I always wake up in bad pain. Such a stunning hotel. MY GOODNESS- I was blown away already by that first photo of the lobby but even more so as I scrolled down. I love hotels that surprise you with a personal note and treat tray- it’s a small gesture on their part but it makes such a big impact on their guests! So considerate of them to offer different types of pillows- my head shape is weird so my neck would appreciate this option. 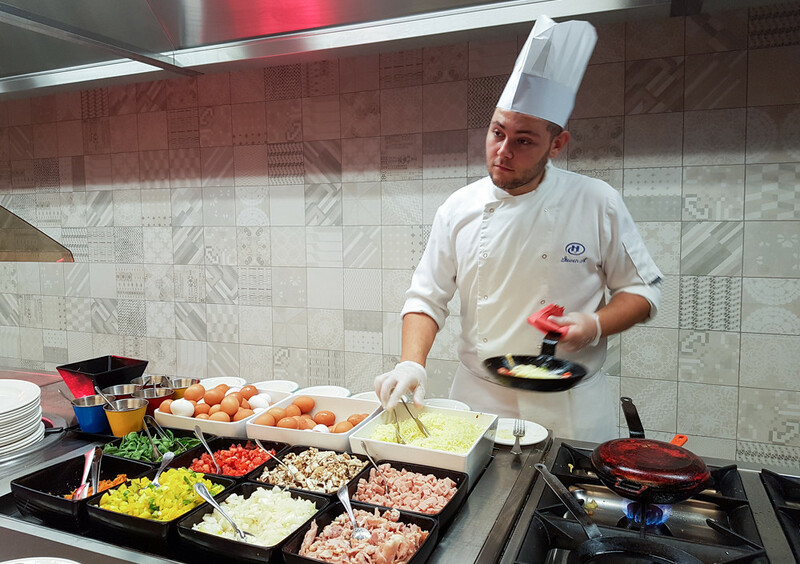 And who can say no to an omlette bar at breakfast?! I’d definitely stay here if I visit Malta one day. Your room really did sound perfect. I’m loving the modern look of everything and the spa areas sound incredible. The restaurants are gorgeous too. This is one of the nicest hotels I’ve seen! You had me at Sauvignon Blanc! I am a Hilton Diamond and would love to experience this hotel. 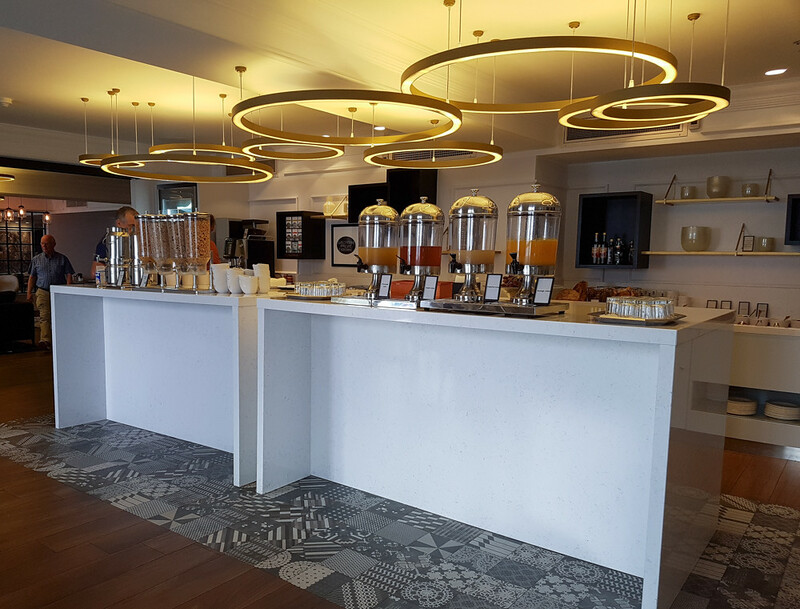 The decor looks amazing and it’s good to know that breakfast and lounge are both enjoyable. An executive lounge is a real treat in the evening for relaxing. Now to find good airfares. Thanks for the lovely photos and the informative review. It is awesome when you find a place that is everything you hoped and you have a comfortable and enjoyable holiday! 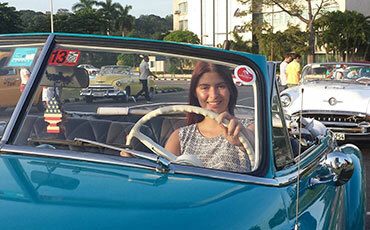 I fell in love with the Royalton in Cuba on our honeymoon because no “I” was left undotted or any “T” uncrossed. They did everything they could to ensure we had a memorable time. Joanna, you lucky thing you! 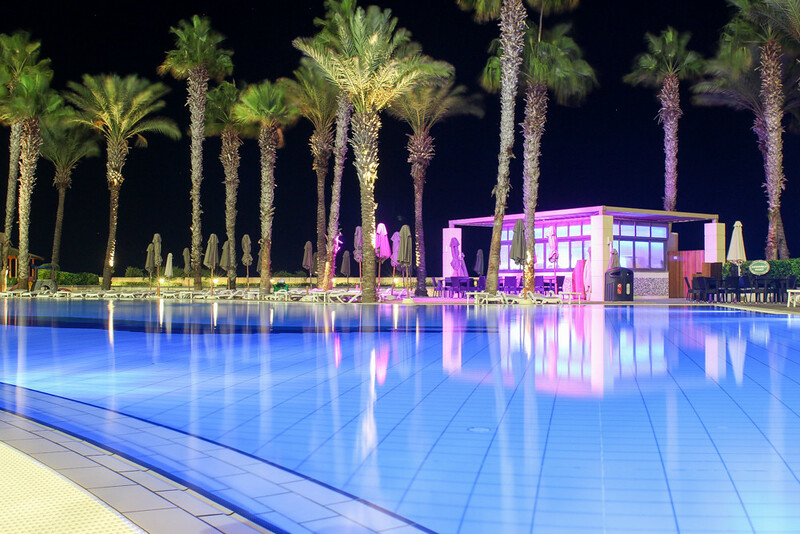 The Hilton Malta looks incredible, never mind a perfect wedding venue, it is a perfect venue fullstop. The room, the meals, the facilities, the extras, wow! Everything just sounds superb. OMG this has to be the nicest hotel ever and I am in love with it too now thanks to you. Definitely worth a stay. I love the way the hotel looks and the view is amazing. I can go on and on, but your pictures really do all the talking. Wow, this blog post really stood out to me today. Very nice. I’ve been to several Hiltons and they are always nice hotels. I don’t think I have ever fallen in love with a hotel before…a destination yes but not the hotel. I do love hotels with a view though and this one has a stunning one. I love how blue the water is. That is such a lovely hotel! You’re definitely going to fall in love and you might not want to leave either! I think it’s awesome that you got to stay here. The rooms are lovely as well! Looks like a piece of heaven! You are right! one can fall in love with this hotel. “Ever Fallen in Love” is a Buzzcocks song. If I had to answer YES or NO, the answer would be NO, but I’ve come close. The Lloyd Hotel in Amsterdam was really unique. My friend thought it was a former prison, but it was a former school. You had to walk through the bathroom to get to the beds, lol. What stood out the most from your post was the speaker pillow. It can help you WAKE UP (like the Mad Season song) or you can play A SONG FOR SLEEPING (like the STP song). Your use of lighting makes the hot tub picture look so enticing! I am definitely in love with this luxurious hotel!! i can’t get over this pictures yet. Wow.. That view is amazing! I loved to read that all rooms overlook either the sea or the Portomaso Marina. That is a big plus. I love waking up and looking at a stunning view. I agree on using the keycards for the lifts. I’ve seen that before and I think it’s a great method. It’s amazing you got a tray of cakes as a welcome. I’ve ever seen a hotel where the cleaning lady comes in several times a day. Impressing! I love the facilities. A gym and spa are awesome! That makes my holiday. Your questions to the management are great. I love it to know the philosophy/ ideas when going to a hotel. They do great work! I fell in love with a hotel once too: The DoubleTree by Hilton at Key West, Florida! Looks like a lovely hotel to stay in. I haven’t stayed at a Hilton before but just like you I’ve fallen in love with hotels on my travels too. Wow, that’s more than just perfect! I would fall in love with that hotel straight away! Actually I have a favourite hotel and it’s Vdara in Las Vegas. It’s not that luxurious as some of the other hotel there but the rooms are super functional. oh my, this hotel is truly stunning! 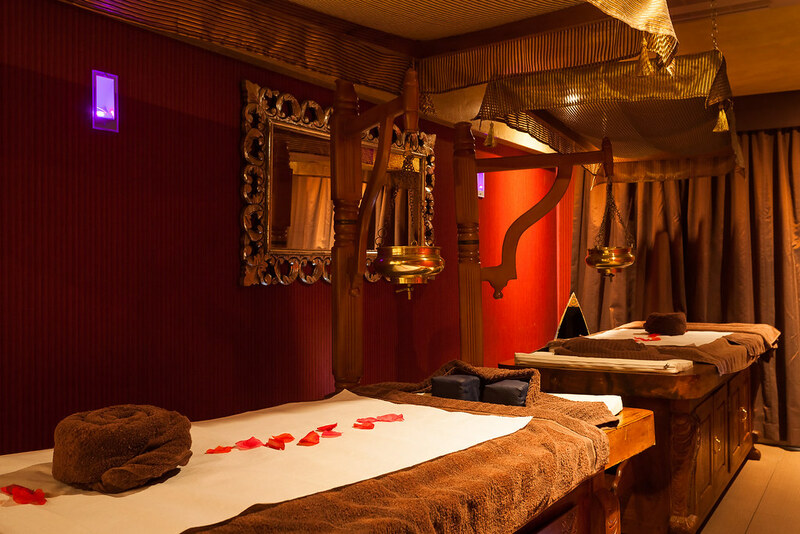 I could get lost in that Spa, probably would not leave voluntarily – and the Blue Elephant restaurant is exactly what I love! So perfect! Thanks for sharing, blessings! I totally understand why you must have loved this place. I would definitely for fall for it for it sure. The hotel is luxurious and the facilities are commendable. The best thing I liked was the welcome thought. I appreciate such gestures. The hotel looks so amazing, it’s HUGE and looks like one that has all that one needs in one place. Gorgeous hotel, with great facilities! I can totally understand when you said you fell in love with this hotel. Look at the location of this Hilton hotel with the overlooking of the sea and the marina, not to mention about The Blue Elephant restaurant, unique and gorgeous at the same time. Omg, it truly has all the comforts one could dream! I’ve never fallen in love with a hotel, but if I’ll ever do, this is it! Ahhhh, that’s how I felt at the Hilton Cabo. Fell. In. Love. Wow I think I have fallen in love too! What a beautiful place and that view is just amazing! Wow this photos of the hotel are so visually stunning. I am dying to go there now! Booking a trip soon! Thank you for sharing this post with us! Fell in love? I want to live there. The place looks super clean, profesional and very elegant. Love the style and how everything seems to be new, love it! The luxury sea view from the balcony is breathtaking! The location seems to be perfect. Excellent review! I would love to visit this place in the future!! Thanks for sharing! I’ll be keeping in mind! Who would have not fell in love to this Hotel? It’s like living away from home, but you’ll enjoy the one stop shop kind of experience that will surely replete your desires. I never have heard about this Hotel and its really an interesting and kind of expensive since it looks like a luxurious Hotel. How I wish to experience this as well. I love how you describe this Hotel. 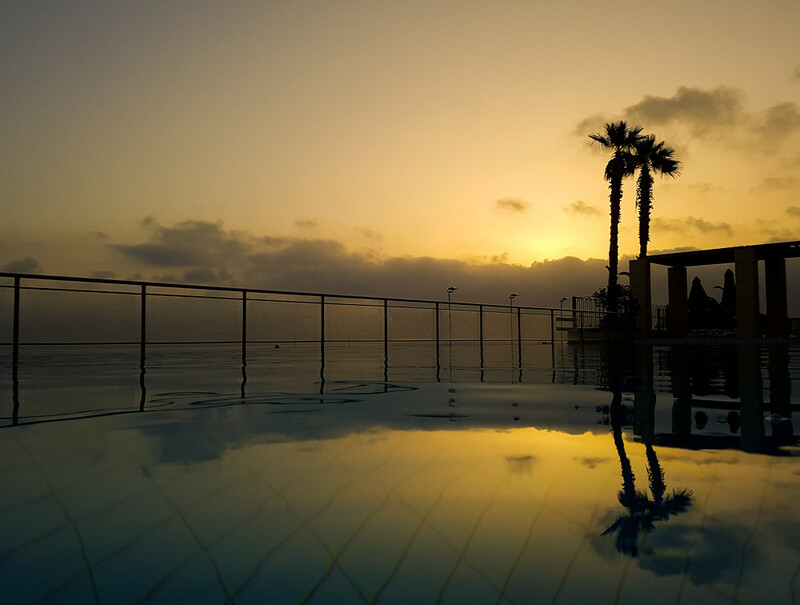 I totally concur with the fact you fell in love with The Hilton Malta. Unfortunately we were already in love with this hotel even prior to the refurbishment, but now it’s like an affair you could never stop going…..three visits this year alone and more than 25 nights !! This hotel however is run by one of the most amazing Hilton team…their dedication to hospitality goes far beyond ones expectations…lead by an amazing GM and truly wonderful staff at all levels. See you in 2017, already booked. I NEED to stay in this hotel! I absolutely love it and is totally up my alley! That bed looks comfy as heck and it’s so awesome you had a balcony to enjoy the views! The food also looks delicious! I have yet to stay in a Hilton hotel. I hope I can soon! It’s really a wonderful hotel: the pillow list would easily make me falling in love too since I always have hard time getting a pillow that fit my needs when travelling! This hotel looks lovely! I love how they have a pop of colour in their lobby. It seems very welcoming! Have you ever fallen in love with the hotel? Yes, I did, just now. Would love to visit it sommeday or any of the high class hotels actually. But what is important is not the hotel, but the whole experience of the trip. I love Hilton chain and Hilton Hotel in Malta looks like a complete destination in itself! Starting from the reception to the splendid view from each room, pools and amazing restaurants, this hotel would be my first choice to stay in Malta! I’m sure you would have loved your stay out here! What a great hotel! It’s nice to have such a different selection of restaurants to choose from. The short answer is no I don’t think I have ever fallen in love with a hotel but Crown Tiwers in Melbourne would be close. I have stayed at the Hilton a few times in the past over the course of my travels but never in Malta. This hotel looks sensational so I can understand why you fell in love. I could eat breakfast on the terrace with that view every day and not get tired of it. Definitely on my list of I make it to Malta. This hotel looks amazingggg! I’ve never fell in love with a hotel but I might have after seeing your photos hehe. You’re so lucky to have been able to stay here ??? Would love to stay here one day!!! I love hotels! And looking at all these amazing photos makes me fall in love with it instantly! It was like a palace! I love everything from inside to the outside. It is very luxurious indeed! Oh wow I’m amazed with the amount of care and customizations they offer to guests! I’ve never known a hotel that gives pillow options lol! The food looks so good, I usually dread hotel food almost as much as flight food, but this looks like a feast! Did you think the price was a good deal for all these amenities? Before I started reading the post, I was wondering “how can someone fall in love with a hotel” . After reading the post, I am saying to myself, “how can someone NOT fall in love with this hotel”? That cake tray and that spa! OMG. The next thing I will do is check the tariffs! This hotel looks and sounds really lovely I have to say. I particularly love the little welcome cakes. Nice touch. I´m so glad you had good weather too. My sister was there just a few days ahead of you and they had a few rainy days. But from your pics it looks like you had a fantastic break. very thorough review and pictures – I almost feel like I was there! Definitely know where I’ll be staying when I visit Malta in the future! I have fallen in love with many hotels in my day and, unlike boys, have loved more than one at once. This looks like a stunning property! Malta is definitely the destination du jour! This hotel is incredible! I love the incredible views of the water and the pool looks superb. Definitely think I could do some good relaxing there haha. Hotels like this are overrated as for me, but just from ur photos, oh my Lord, this hotel is beyond perfection. ANd I don’t mind waking up to this every single day! Added to bucket list. That looks like an amazing place to stay – I love when hotels give you a pillow menu! And it’s so cool that every room has a sea or marina view – that’s enough to make me want to go there now! I’m a huge fan of any hotel that has a pillow menu! Looks like a great place to stay when looking to travel on the luxurious side. Totally relate to what you’re talking about!!! i have had a great experience myself, staying at the Hilton, Charlotte Center City… They have their own niche all together. No wonder you had a great time. The pictures have come out really well! I have never fallen in love with a hotel, but I can see why you did with this one. The view is great. Th lobby is stunning and the room looked perfect! I can definitely see why you have fallen in love with the hotel. I mean, can you spell out perfection? You would definitely wish that you could live there forever. Wow! This may be the most beautiful Hilton Hotel I have ever seen. Also, I need to visit. 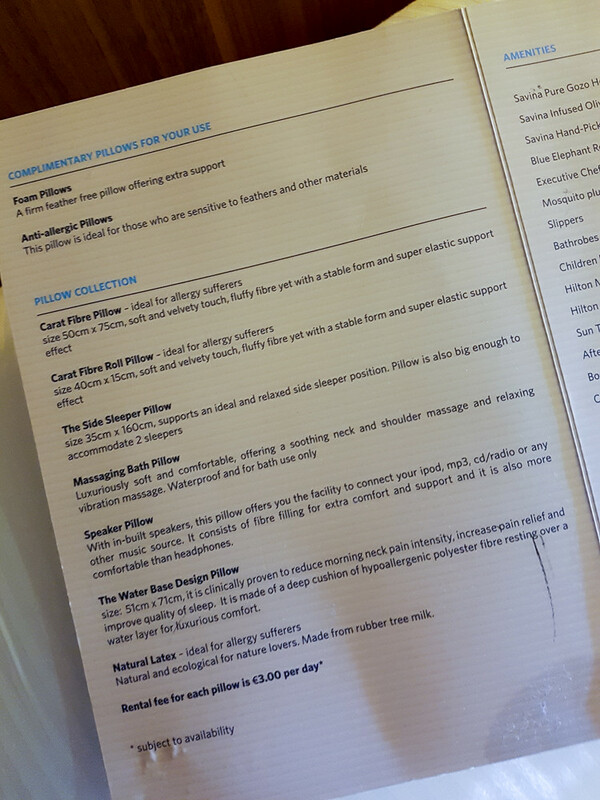 As a luxury traveler, I feel like the HIlton Malta covered all their bases – and that pillow menu? Top notch offerings. Your pictures are stunning. It is clear why you “fell in love” with the hotel. I love the executive lounge where you can enjoy privacy and mid-afternoon snacks. 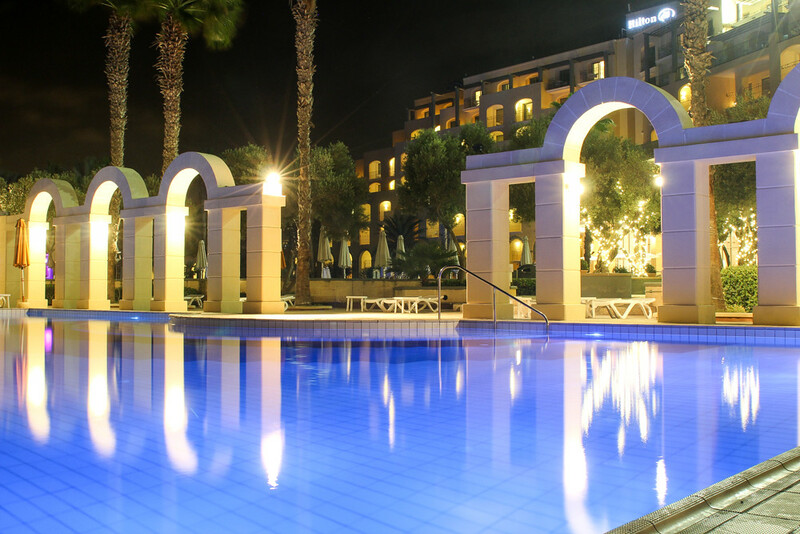 The Hilton Malta seems like the perfect oasis to relax and be pampered. Excellent review. What a gorgeous hotel! Malta is supposed to be an amazing place to visit, and it looks like the Hilton there is perfect. I certainly hope you could tear yourself away from the hotel at least a bit to see Malta! I was there a few years ago for a conference, also staying in a large (different) seaside hotel, and was blown away by the island and the wonderful food there. Gosh, what a wonderful place. When I first read the blog title I thought, “hmmm no, I don’t really like hotels”, then saw the first photo and WOW! I was reminded of the luxury resorts in Maldives, oh I miss being treated like a princess. Such a wonderful experience in a stunning island! The hotel looks amazing, you were really lucky to stay in such a beautiful place! 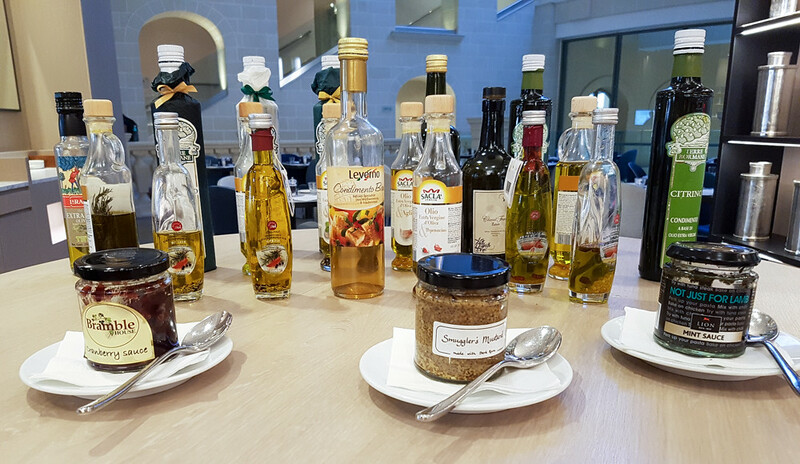 Great read and tips for our visit to Malta! The bed does look comfy and such incredible romantic views from window! It is no wonder you fell in love with this Hotel. Every looks and sounds amazing.The reception area is so posh. I love that regardless every room has a fantastic view. This looks so luxurious! I would love the cooking station for breakfast. Such a great feature that would start your day off right! A great place to relax. Rooms are also nice, I really like the scenery outside it. There are plenty of dining table with a beautiful view in the vicinity. That is very fun. A pillow menu, amazing interiors, fantastic views and good food. What more do we need! I particularly love the ceiling lights in the first few pics… Lucky you – is all I have to say! Wow! This hotel looks spectacular, the interiors and everything in on point. I totally understand why you’d fall in love with a hotel. It’s got great ambience, restaurants and activities to keep you occupied. This is somewhere I would love to stay and relax! Also, the pictures are beautifully taken. A pillow collection, oh man…. talk about being spoilt. What a dream, no wonder you fell in love 🙂 Malta really needs to be ticked off my list, so many friends have been over the years and come back with great stories. If I would’ve stayed here, then YES I would have fallen in love with a hotel 😉 I love the Vista lobby lounge – if I stayed here, you wouldn’t be able to get me out of the room. That sparkly decor speaks to me 😀 What a great base to explore Malta! I was in Malta last year and I stayed at the Excelsior which was also majestic! The Hilton is on my list next time I am in Malta again! A hotel room with a view of perpetual seas is incredible and what a lovely way to welcome with those delicious looking cakes. Glad to know that people at Hilton are Eco-conscious and believe in giving back to the society. Not yet, but it’s easy to see myself having the same sentiments as you toward a nice hotel. As a backpacker, I always stay in budget inns and rarely check into hotels like this one, but when I do it’s always a nice experience. I love the location of Hilton Malta and the views. How is it possible that all rooms have a view of the sea or marina? What a breathtaking hotel! If I were here I would totally forget exploring the outside, I’ll probably just stay inside the hotel and bask at all that luxury. Love you room as well, esp the headboard of your bed hehe! 😀 Safe travels always! I think we all have that one special hotel that sticks out in our mind as our ultimate fave. I stayed in a Boutique hotel in Cartagena Colombia last Christmas and completely fell in love with it. So yeah, I do think you can fall in love with a hotel and I can fully see why you fell in love with this one!